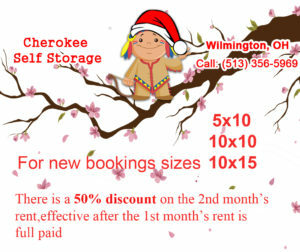 Cherokee Self Storage Wilmington is located right off I 71 between Cincinnati and Columbus. It is also across from the ever-popular Caesars Creek Flea market and a few miles from the beautiful Caesars Creek lake and recreation area. Cherokee Wilmington is a brand-new facility with drive up and walk to storage units. Sizes vary from 10 x 30 to 5 x 5. The facility is on Rte. 73 before you reach I 71 if you are driving from Waynesville and just after the I 71 inter change, if you are coming from Wilmington. Cherokee has plenty of parking for boats, RV’s and campers. For your safety the gates will be open from 6AM to 10PM everyday.